I was so excited to find these cute napkins and napkin rings at Sur La Table! They were singing spring and I had to join the chorus! 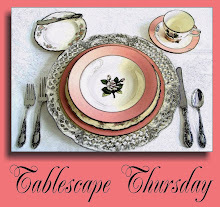 For more Tablescape Thursday posts, head on over to Susan’s by clicking the button below! Oh I love those napkins and napkin rings! Lovely. Sur la Table is so great!! This is a fun table Lana G! Hi Lana! Oh, I love your new napkin rings too and the napkins are just perfect with them. You do set up the most wonderful tables. I love those napkin rings. What a cute table. Any thing polka dot is mine..all mine! Fabulous…wonderful and I love the bumble bee napkin ring too! Cool Bees! I want some! I don’t know what Sur la Table is, but I intend to find out! These are the cutest things I’ve ever seen!! Oh, how beautiful it all is! Those black polka dot napkins just makes everything pop! Ooohhh, pretty bees on that cute table! Good morning! I just joined TT this week. It is so nice to make the rounds and meet all of you long time TT ladies! Beautiful tablescape you’ve created! I adore the bee napkin rings. What a great tablescape. I found a great yellow bee tablecloth but I resisted. After seeing your post, I may decide to go back and buy it. I enjoy seeing what everyone has to show us each week. Fun, fun table. Love the bees. J’adore that bumblebee… ooooh c’est tres adorable! I love those napkins and rings. How pretty they look against your plates. Very fresh and very spring! That is very pretty..Love the plates as well as the napkins and rings! Oh, how lovely! I am a gardener and wildlife lover, so I was especially taken by your choice today! I adore your napkin rings and napkins. I love your plates as well. Oh and that centerpiece….